DEAR PAPERLICIOUS: Let's Have Coffee! Love this adorable set designed by Claire Brennan for Gina K Designs. It's called Petite Patissierie. I have a lot of ideas for this set as my husband loves to go to a bakery shop in our neighborhood, and we learned recently that a new one is popping up 1/2 block from our home. This could be trouble! Patterned paper is from last year's Stampin Up catalog. MOOD WHEN DONE = I went through 7 versions of this card, making errors all along the way. This was the only one that emerged from the disaster that is now my craft room. When this happens I contemplate selling off all my supplies. Do you go through this? In any event, I'm almost happy with the card! 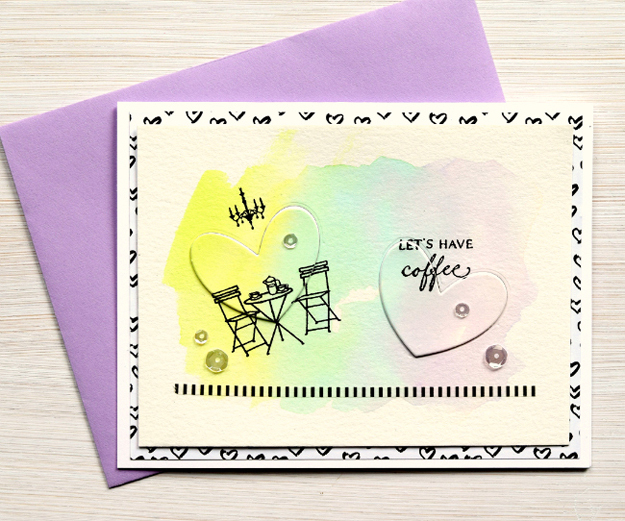 Trial and error, we all do, but your card turned out so perfect! Musta been that try, try again motto! It may have been a long road, but it turned out great. You make it look a lot easier than it actually is. I think this is very clever. Sometimes I have the same feelings, Joan. I love this soft pretty card! The design is wonderful. I know what you mean about too many errors to keep a card but your end result is awesome!